Introducing slow and steady Red Jasper, the abundant and reliable “rock of ages”. Red Jasper is a variety of quartz containing iron oxide impurities. To understand red jasper, it helps to be familiar with quartz and the way it forms. Quartz is considered the singularly most common mineral on planet Earth, and presents itself in myriad forms and colours. To begin with, we can separate quartz into two main groups – macrocrystalline and cryptocrystalline. In macrocrystalline quartz, the individual crystal formations are generally visible to the naked eye, because the crystal structure is repeated over a long enough distance. In cryptocrystalline quartz, the crystal formations are not repeated over a large distance, meaning that even with a light microscope, the crystal structure is not distinguishable. Cryptocrystalline quartz can be further separated into two groups – fibrous and granular. In the case of fibrous cryptocrystalline quartz, the crystal structure forms within elongated fibers. In granular cryptocrystalline quartz, the crystal structure is repeated within tiny grains, which do not align perfectly with neighboring grains, meaning the crystal structure is not repeated in a discernable pattern beyond each grain. Granular cryptocrystalline quartz is often referred to as Chert. Jasper is a variety of granular cryptocrystalline quartz, which is thought to have formed when solutions rich in silica replaced calcareous rock. Mixed in the granular quartz are impurities of iron oxides such as hematite or goethite. Essentially, iron oxides are “rusted iron”, hence the characteristic rust-red colour of red jasper. A discussion about red jasper is not complete without some mention of other minerals that bear the name Jasper. According to traditional gemmologists, only granular quartz containing iron oxide impurities fits the true definition of jasper. However a whole range of minerals of different description and colour have adopted the name as well. There are true jaspers other than red jasper that still consist of granular quartz and iron oxide impurities, but occur in varying shades of yellow and brown, and often with intriguing patterns, formed through the layering of other impurities such as volcanic ash or sediment. These are referred to as the Picture Jaspers. Other minerals are referred to as jasper simply because of fleeting similarities, and may not technically be jasper at all. But names often stick, and those minerals have retained the name. Red Jasper is very common the world over, and forms frequently in massive formations or veins, but may also occur as an inclusion in other minerals. It is often the mineral that replaces the organic matter in fossilized bone or wood. It is also the red mineral in tiger iron, and the “blood spots” in bloodstone. Jasper is commonly used as a decorative stone in statue carving or even tiling. It also is used in jewellery. Jasper (though not specifically red jasper) is highly represented in ancient history. The word is derived from the Greek word, iaspis, which itself is a derivation of the Hebrew word, yashepheh, coming from the root word meaning “to polish”. Jasper was one of the stones in the high priest’s breastplate as mentioned in the Old Testament. According to the Book of Revelations, the New Jerusalem will be built with jasper as it’s 6th foundation stone. The Egyptians carved scarabs and other amulets from jasper and inscribed them with protection incantations for the passage to the afterworld. The ancient Greeks used jasper to ease the pain of childbirth. Native Americans believed that jasper could help bring rain. They also used it as a protective talisman to guard against dangers such as drowning and scorpion, snake and spider bites. 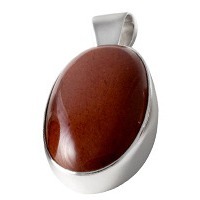 Red Jasper’s energy is characterized by it’s slow and stable, gradual effect. This is not a quick fix remedy for anything – slow and steady wins the race! Soothing and calming, red jasper works by affecting change and progress gradually and constantly. It is stabilizing and considered valuable in leading to and maintaining good physical health and emotional balance. Red jasper helps to both balance and strengthen the base chakra and improve ones connection to the Earth principle, thus sharpening the instincts and calming the nerves. It may awaken kundalini energy and improves the flow of Chi (life force) through the body. This results in increased physical stamina and endurance and improved momentum and commitment in other areas of one’s life as well. This may manifest as improved sexual appetite and performance or as heightened spiritual awareness. It also helps manifest creative ideas and lends the momentum to carry these through. It is said that red jasper helps one to remember dreams and inner experiences. It is also a powerful protection stone, and is even used to counteract fears in the night. It is said to help in bringing about justice and encourages truthful expression and taking responsibility for ones actions. 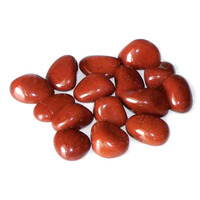 Physically, red jasper is said to assist in dealing with pain, particularly menstrual pain. Because it helps to stimulate the flow of chi, it is also beneficial for those who are recovering from illness. 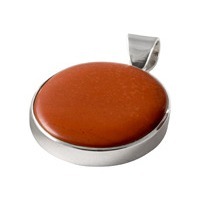 When one is pregnant, red jasper is considered beneficial in promoting good fetal growth. 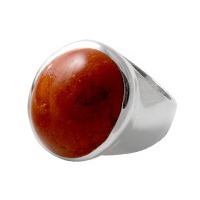 Red jasper relates to the astrological sign of Taurus and vibrates to the number 6.